In 2013, a Boston city crew bushwhacked its way across a mostly vacant, overgrown lot in the densely residential neighborhood of Mattapan. The site had been neglected for at least a few years, and it showed. Trees, brambles, and vines threatened to tumble over the surrounding graffiti-covered fence. Some neighbors had taken to dumping their trash over the chain link. A shingled old house stood amid the thicket, its second-floor windows open to the weather and intruders. Nearby, the doors of a wooden carriage house stood wide open. Inside, the crew found trash, used hypodermic needles, and other signs of squatters. The roof was ready to collapse. For two weeks, crew members cleared out trash and cut back the jungle. They filled six dumpsters. Finally, they got a good look at the house and carriage house (which became known as “the barn”). One of the city’s few 18th-century farmsteads was still standing. 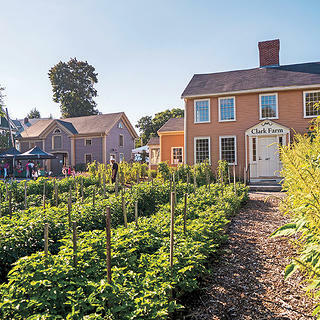 Five years later, thanks to a $3.8 million restoration project spearheaded by nonprofit Historic Boston Inc. (HBI), not only have the historic house and barn been saved, but rows of vegetables grow where once only weeds did. The Fowler Clark Epstein Farm, named for its three major owners over its 200-plus-year history, saw its first harvest in decades last summer. One of the oldest existing farms in Boston is once again in operation. The farmers market at the property. 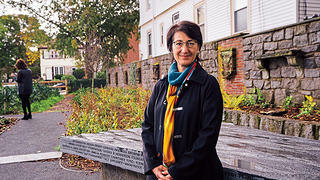 Kathy Kottaridis, executive director of Historic Boston Inc.
Patricia Spence, executive director of the Urban Farming Institute. 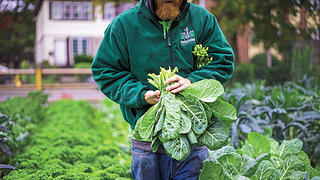 Collard greens were part of this year’s fall harvest. 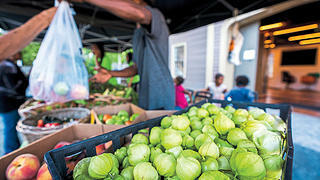 On a Friday afternoon in late September, neighbors inspect the eggplants, tomatoes, and bell peppers at the weekly farmers market on a property most people once avoided. Rows of okra stretch from the house to the busy street. Plate-size sunflower blooms nearly reach the house’s second-floor windows, and tall corn stalks teeter nearby. This bounty is the work of the Urban Farming Institute of Boston Inc. (UFI), a nonprofit organization that runs multiple farms in the city’s lower-income neighborhoods and trains young urban farmers. Just this spring, after teaming with HBI on the site’s restoration, the institute moved into its new headquarters at the farm. “This all happened so fast because people wanted it to happen,” says Patricia Spence, the UFI’s executive director. Though the roughly half-acre plot is far smaller than the original farm, it’s a reminder of when the neighborhood of Mattapan was a rustic village in the relative hinterlands south of Boston. In 1786, Stephen Fowler, a veteran of the American Revolution, left his son Stephen Jr. and his grandsons Samuel, Stephen III, and Jesse 330 acres. Farm fields and orchards covered the surrounding countryside. Samuel cultivated 35 acres and at some point added the farmhouse. It doesn’t show up on records until 1806, but the two-and-a-half-story structure has characteristics typical of late-18th-century houses, such as a central front door topped by a pediment, as well as a central staircase and chimney. As with many family farms, the Fowler land was divvied up as it was passed down through the generations. By the time Henry and Mary Clark bought the farm in 1837 for $1,400, it had shrunk to 12 acres. The Clark family, who would own the property for the next century, built the two-and-a-half-story barn around 1860. Not long after, streetcars arrived, and triple-decker houses began popping up as the countryside evolved into a Boston suburb. Finally, in 1895, the descendants of Henry and Mary Clark subdivided their land into 61 lots and sold all but the half acre with the house and barn. When Jorge Epstein bought the property in 1941, the farm had not seen a harvest in decades. Nor had Mattapan. Epstein was a jeweler by profession, but found his true calling in collecting remnants of Boston’s architectural history. As neighborhoods of brownstones fell to urban renewal, Epstein picked up the pieces, gathering the cornices, doors, windows, and fireplace surrounds from the rubble. He opened a legendary, warehouse-size business called Old Mansions Company, where everyone from DIY types to high-end interior designers could pick through weathervanes, turrets, and columns. The “Scavenger King,” as a Boston Globe article says he became known, embellished his own property with some of these artifacts, working old blue slate steps from the city’s South Station into a terrace. When he built an addition onto the house, he included historical decorative elements such as a carved stone face that reportedly squirted water from its mouth. He paid local kids to cart granite cobblestones—50 cents each—from the streets, and then used the stones to construct a wall. Inside the house he had two unusual murals painted, one depicting the farm in the 19th century, but with people in 1940s fedoras. Another, never completed, shows the farmhouse ablaze. Why it’s unfinished is one of the many mysteries Epstein left behind. Under the Scavenger King’s hand the property became even more of a curiosity among the triple-deckers. Patricia Spence’s family moved to the neighborhood 55 years ago, just a half mile from the farm. She remembers riding her bike past the property with her brother. After Epstein died in 1998, the property began to fall into disrepair. Epstein’s estate petitioned the city to demolish the buildings so it could sell the property to a developer. But after the Boston Landmarks Commission got wind of those plans in 2005, it designated the house and barn as landmarks. The designation saved those structures from destruction, but not from deterioration. Eventually the family moved out. Fowler Clark Epstein Farm is nestled among classic New England triple-deckers and other multifamily buildings in Mattapan. HBI kept its eye on the property. In 2008, the organization, which had a history of helping to reposition old buildings for new uses, scaled up to more complex, ambitious redevelopment projects that would improve neighborhoods or commercial districts. It was essentially getting deeper into the business of community development, specifically in some of Boston’s lower-income neighborhoods: Dorchester, Roxbury, and Mattapan. HBI looks for buildings that are architecturally or historically significant, but it also factors in a project’s potential for community impact. “Some people complain that we are diluting the definition of landmark, but there’s a long list of reasons beyond architecture that makes a building that,” says Kathy Kottaridis, HBI’s executive director. Restoring the farmstead and putting it to use in some way would, at the very least, improve the streetscape, and it had the potential to be a resource for the neighborhood. In 2012, HBI made an offer to the lawyer for the estate, but nothing panned out. When then-Mayor Thomas Menino asked if he could do anything for historic preservation, HBI pointed him to the farm, and his office moved into action. The city seized the property for unpaid back taxes, and then allowed the Epstein estate to redeem it in order to sell it to HBI for $250,000 in 2015. Acquiring the property was only half the battle. Once HBI had the keys to the farm, as Kottaridis puts it, they had to decide what to do with it. The parcel of land covered the equivalent of seven city lots, which is why at first she proposed to her board that they could restore the house and barn and then build a triple-decker on part of the property to generate income. “They said, It looks like a farm. Why don't we make it a farm,” she says. 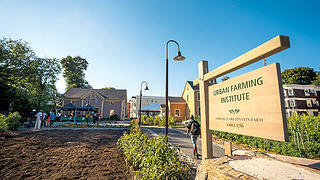 The Urban Farming Institute manages and operates the property. 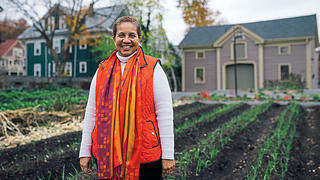 She turned to the Urban Farming Institute of Boston, founded in 2012. 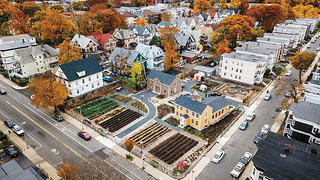 The UFI is at the forefront of a movement that took off in Boston six years ago, when city zoning was changed to allow urban agriculture. Last year, the institute harvested 13,500 pounds of produce from its seven farms around the city, much of which was sold to Boston restaurants. But back in 2015 the UFI was still a very new organization. That was Kottaridis’s one reservation. Spence admits that shortly after Kottaridis approached her with HBI’s proposition, she told her board that they had “about five cents” in the bank, but there was this $3 million project that would be great for them. The UFI seemed like such a natural fit for the farm that HBI took a chance. The institute agreed to take on a five-year lease that includes the management of the property, from taking care of snow plowing to overseeing rentals for special events, such as weddings. 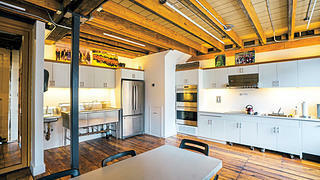 It was charged with raising $100,000 to create a demonstration kitchen and classroom in the barn. HBI secured $1 million in historic tax credits and raised an additional $1.4 million for the rehab project. The Trust for Public Land, a national nonprofit that works to establish parks for communities across the country, signed on to make the farm a farm. It agreed to raise $400,000 to $500,000 to fund infrastructure projects, such as trucking in soil and installing a water system. 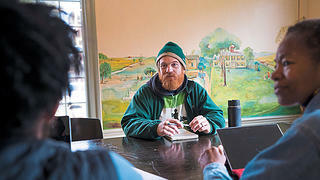 Students in the historic preservation carpentry program at the North Bennet Street School in Boston’s North End volunteered to do the work on the house, under the supervision of their instructor, Michael Burrey. The architecture firm Perkins+Will donated more than 1,000 hours of design services to the project. In September of 2015, project architect Stephen Messinger of Perkins+Will visited the farm for the first time. “If it hadn’t been falling down, I would have said let’s not touch it, because it was such a powerful experience,” he says. But the barn was in dangerous shape: The second floor was sinking. The city had shored up the roof, but it was only a temporary fix. The building was slated to be transformed into offices for the UFI, which meant the second floor needed to be reinforced with steel so it could support the weight of file cabinets and office equipment. The house was structurally in better shape than the barn, but it was filled with water damage. It would also need reinforcement to meet building codes. 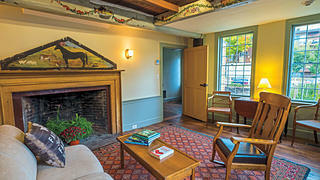 The sitting room in the farmhouse, which contains restored details from the Epstein era, is used for meetings. 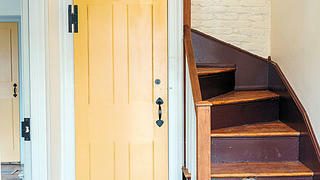 The house’s main stair and basement door. The UFI holds canning, cooking, and mushroom-growing classes in the barn’s demonstration kitchen. UFI employees Nataka Crayton (left), Tristram Keefe (center), and Linda Palmer (right) in front of a 20th-century mural in the farmhouse. Though the project was relatively small in scale for Messinger, who mostly works on new construction, it was complicated. Not only were the buildings dilapidated, but to save them he had to balance the three competing demands of transforming the property into a farm, making it a kind of community center, and guarding its historic character. Further, because the project received federal historic tax credits, the buildings would have to be made accessible. And the front door was not wide enough for a wheelchair. Even if the team wanted to do a strict restoration, they had no usable photos and few documents to work from. They didn’t even have a clear date on when the house was built, only that it appeared in city records by 1806. In the end they decided on an approach that would showcase the property’s many lives. In the barn, the team did not hide the needed steel reinforcements, given how utilitarian the structure is. They also left a weathered door stamped with the name “H. Clark” on the first floor as a nod to the past. They did hide the steel reinforcements in the house under the original flooring on the second floor and returned the exterior to its historic look, with painted clapboard siding. Students from the North Bennet Street School removed the gray shingles Epstein had added and found that the windows had originally been much larger, with 8-over-12 panes. Replacements custom made by WW Woodworks now fill frames built by the students. Once the windows were returned to their original sizes, natural light filled the rooms as it would have for the Fowlers. The walls were painted the light tints favored in the Federal era, but the Scavenger King’s mysterious murals were left in place and given a good cleaning to remove the soot and old varnish that discolored them. Epstein’s addition became an apartment for the farm’s manager, and his wall constructed from cobblestones was left in place. To make the property a farm again, site contractor Hurst Landscape & Site Services dug trenches to retain water and added a driveway that could accommodate a truck. The site was also regraded during a Boston winter. A large balloon made of blue tarps was constructed to keep the crew warm and to heat the frozen soil, but luckily a burst of relatively warm weather softened the ground enough for an excavator to chip away at it. In the end, the project honored all three past major owners, while preparing the property for its new life. The Urban Farming Institute’s Farm Training Manager Bobby Walker and Operations Manager Nataka Crayton on the front steps of the farmhouse. Michelle Montolio, a graduate of the UFI’s training program, working at the market. 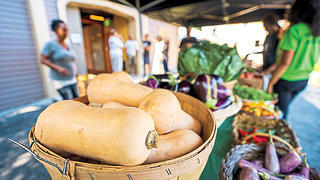 Butternut squash at the market. Hurst prepared about half the property for planting, laying down a barrier over the old soil and trucking in compost. When they were done, the UFI’s trainee farmers went to work, and by the summer of 2018 the rows of vegetables, including kale, corn, and collard greens, stretched from the house to the front split-rail fence. 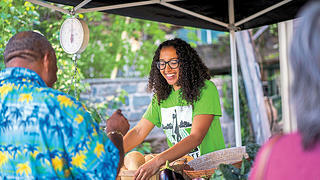 The farmers also planted amaranth, Aleppo peppers, and Scotch bonnet peppers, which are popular with the neighborhood’s many West Indian immigrants. Nothing went into the ground that wasn’t edible, including the fruit bushes used as landscaping and the wintergreen that serves as ground cover. When more than 500 people showed up for the grand opening in late June of 2018, the farm looked like a farm for the first time in more than a century. It also felt like one, as the once-vacant property buzzed with activity. Over the summer and fall, the institute’s trainees could be spotted each morning weeding their way down the rows of vegetables, which grew taller by the day. In September the farm hosted its first wedding. On Friday afternoons through October, people came to the farmers market to buy the well-priced produce and to see for themselves how the former eyesore has been transformed. They compared stories about Epstein, wondered at the height of the corn, and did something very few city dwellers ever get a chance to do: They toured their neighborhood farm. Amy Sutherland is an author and journalist based in Charlestown, Mass. She writes the "Bibliophiles" column for </em>The Boston Globe<em>'s Sunday Books section, and is working on a book about her experiences volunteering with shelter dogs.